Protect your data like never before! Cloud storage and backup is a managed storage service that removes your data offsite and places it in a secure data center for protection. It can either be used to replace your onsite hardware or work alongside it as a backup plan. With locations in Naples and Orlando, Florida, SkyLink provides your organization with the most efficient, secure, feature rich, and easy to use cloud storage and backup software you can buy. Data backed up to cloud storage through a provider like ourselves can be encrypted, protecting it from unauthorized access. Other security options, including restricted access for individual users and file locking can help you have the ultimate control over your data. Best of all, cloud backup and storage enables you to have mobile access to your data from anywhere via nearly any mobile device. Worried about security? No problem. SkyLink has you covered, no matter how many devices you use, where you go, or whether you lose the device along the way. Take a look at our benefits below! We said we were the best, and with custom storage options and high grade, 24 hour surveillance and security, we certainly deliver. SkyLink’s cloud storage and backup options have several features that you can utilize in order to get the most out of our services. Best of all, it comes at a competitive and affordable price! Granular Security Controls – Easily control access to files on a company, group and individual user basis. File and Folder Locking – Prevent unwanted changes to files and folders. Mobile Access – Freedom to access your files from anywhere on virtually any device with the FileCaddy App for phones and tablets. Ability to remotely wipe sensitive files from lost or stolen devices. Sync across computers and mobile devices. Flexible Storage – Cloud-enable any file server. Store data to any data store type such as on-site servers, remote servers, etc. Reliable and Secure Backup – Continuous, real-time backup provides peace of mind that all your stored data is safe from accidental deletion, corruption or any type of data loss. Guest Accessible – Allow guests to upload files to be accessed by you and your employees. Rapid Deployment – 5 minute onboarding and setup to provide fast and easy startup. What is Cloud Storage? : Before you delve into buying cloud storage and backup services, it’s good to know what they are first. This article goes into detail about the various types of cloud storage options and what unique advantages each one brings to the table. Hosting Services vs. Cloud Services: Debating between traditional hosting services and cloud services for your business? No problem! We break down the difference between these two services for you and answer the most common questions, such as pricing, advantages, and more! 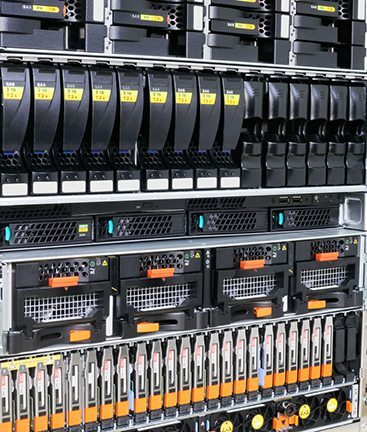 Why Your Business Needs Data Center Services: If you aren’t sure whether outsourcing your data management to a data center like SkyLink is advantageous for your company, read this article. It will tell you exactly what colocation does for your business and whether it’s the right fit for your needs.